This was my entry to Round 2 of Paper Crafts & Scrapbooking Gallery Idol 2014! The theme was die cuts. Oh geez, I panicked (well first I had a stomach ache from the excitement, then I panicked, lol) as I haven’t had my die cutting machine but 9 months maybe? Mmmmm…No time to panic. Cut. Create. I came up with this card. The hardest parts were: a) picking what colors to use (endless combos I thought) and b) die cutting all those chevron pieces….over…and over…and over. OH and finding everything on my paper bit covered desk! 🙂 But it came together in the end. Phew! The other entries were stellar, to say the least…and somehow I made it through to the Top 15! I’m pretty sure that “somehow” was because of a HUGE leg up from family and friends votes. Many thanks! 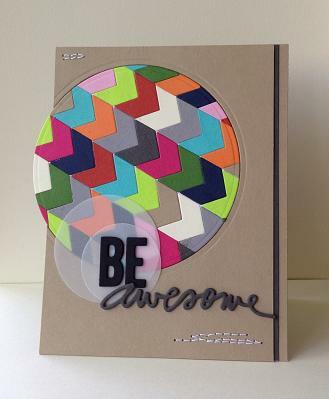 Thanks for popping in…Be awesome! Supplies: MANY cardstocks and Dies: Technique Tuesday “Say it: Awesome”, Lawn Fawn “Cole’s ABC’s”, Avery Elle “Chevron Bits Elle-ments”, Spellbinders Circles.